Twomey Russian River Pinot Noir, an expansion of the vineyards and cellars of the 75-year-old Silver Oak winery, is rich in red berries and creamy spices, beautifully capturing the combination of Old World traditional wine-growing distinction and California's finesse of leading edge technique. Continuing a family grape-growing tradition dating back to the early 1920s, Napa Valley's Emmolo winery rests on its original property, offering vintages like their Sauvignon Blanc - a unique expression of soft body, firm acidity and the fresh, clean aromas of honeysuckle and tangerine. 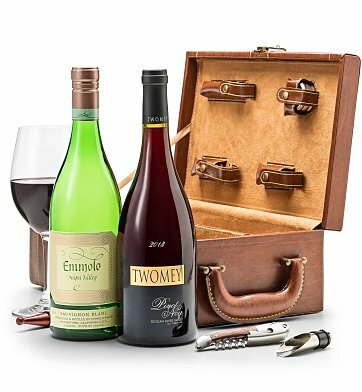 These two wines are nestled in our signature leather carrying tote with a complete set of stainless steel tools, creating a generous gift with a character that won't soon be forgotten. One bottle each of Twomey Russian River Pinot Noir, and Emmolo Napa Valley Sauvignon Blanc. For more information on this wine, please see the Tasting Notes. Personalize It! Complete the personalization option during checkout and we'll add an engraved plaque to your gift. Select one or two lines of up to 15 characters per line, or choose an elegant three character monogram. Measures 11" x 8" x 5"
Pacific Valley Wine Duet with Fine Tools is a hand delivered gift. These gifts are delivered by one of our local design centers located throughout the United States and Canada. Same day delivery is available for most gifts when ordered before the cutoff time. The cutoff time for Pacific Valley Wine Duet with Fine Tools is 1 PM in the recipient's time zone. Twomey Russian River Pinot NoirTwomey Pinot Noir is bursting with flavor but not at all heavy: a clean, crisp beam of red fruit that picks up complex aromas of lilac, red berries, spices and rosemary. Twomey Russian River Valley Pinot Noir is a rich, multi-faceted wine with great fruit and spice expression. It has a dark, cherry-red color and a complex nose of potpourri, ripe strawberries, cardamom, nutmeg and peat. It has a fruit-sweet attack, a fleshy mid-palate and notes of blond tobacco and coffee bean on the long and slightly tannic finish. With proper cellaring, this wine will give drinking pleasure through 2024. Two Esteemed California wines: Pinot Noir and Sauvignon Blanc. Presented in GiftTree's signature leather wine tote with tool set.